Hi Bett. My parents live in Brisbanes WEST. They cut the top of their yellow pawpaw for the same reason as you did. They are in their 70s. Mum was so proud of the crop on the tree now. Without counting it looks like 100s growing all up the sides of the tree. Within reach. The one thing that we always make sure of is, that we cut above a branching point(node). We usually cut leaving 6inches to a foot above these side branches. Not on the single trunk. Hope this helps. This worked for their mango tree also but usually the mango fruits after the second year of regrowth. Incidently, their pawpaw is the best tasting I have tried. No Iodine taste. The bad thing is there are hardly any seeds in the fruit to try and grow some more. Hi Bett. Yes that is what I meant. Just couldn't think of the right name to call them. Still can't. Good luck with the PawPaw. 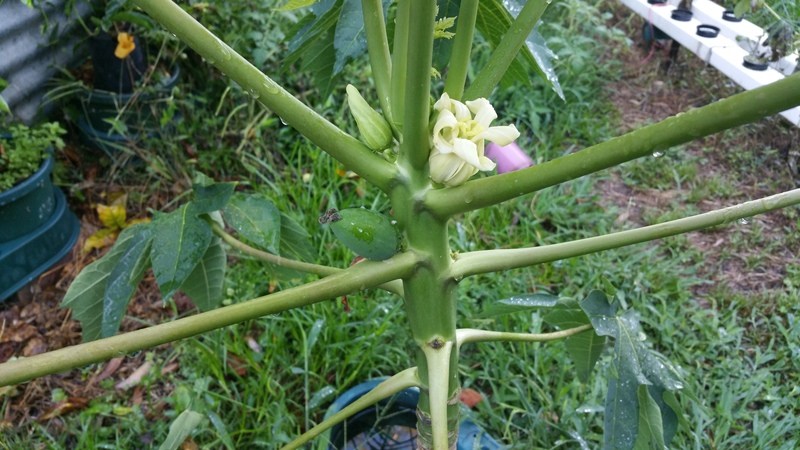 Have you looked at the link on this site regarding PawPaws.It shows a PawPaw cut off short with a tremendous yield on it. You may want to address that member on what they did. Regards Jan.
Hey Bett. Here is the link for you to cut and paste in your address bar. Or you will find it in the BLOG section of the forum. Regards Jan. Here is the video that kath did on the paw paw that was grown from a cutting. Also a picture of me standing infront of this paw paw. 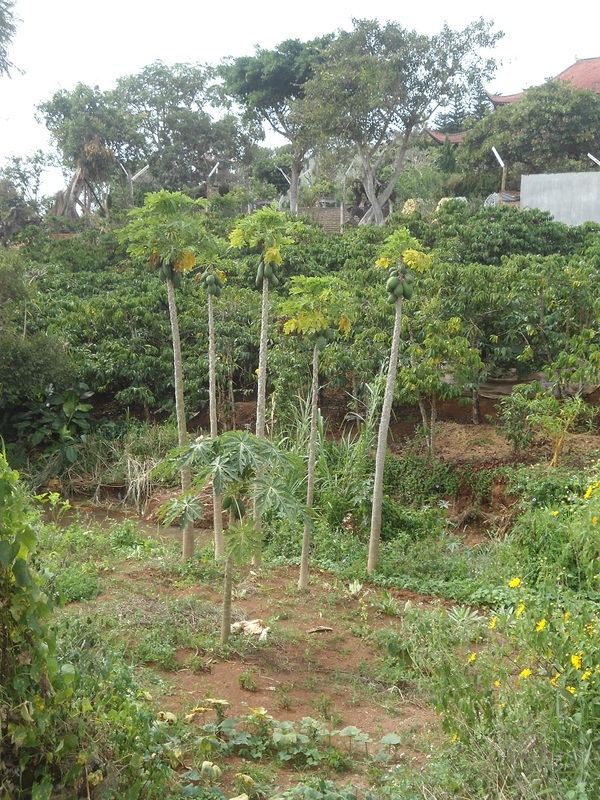 When I lived over in Hawaii for near seven years, I had many fruit trees including paw paw (we call it papaya). To stop the plants getting too tall we put a large coffee tin over the top of it. You could also use a small bucket of some sort. It doesn't kill the tree and it stunts it's growth. The tree still produced good fruit from the branches it put off at the side. How do you take a cutting from a pawpaw? Take the top of a pawpaw? 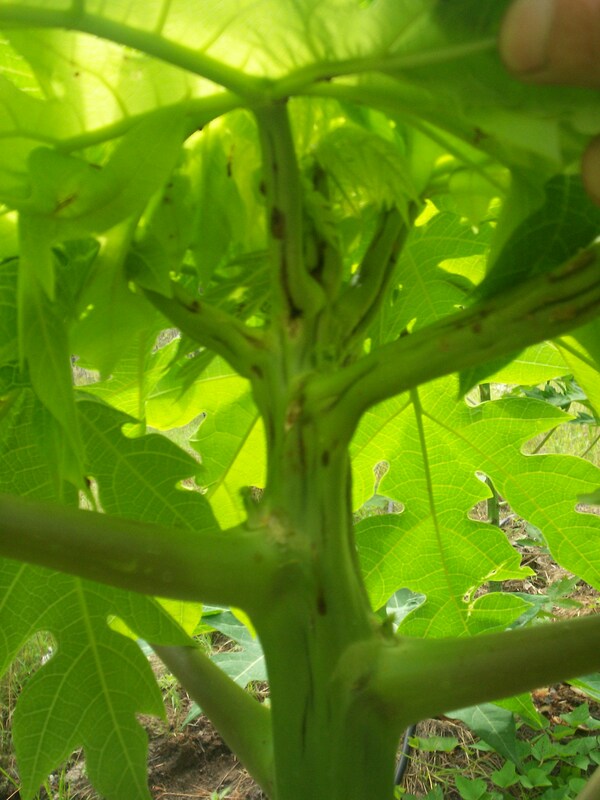 We usually cut the tip out of the pawpaw and get it to shoot from the trunk, these shoots are then used as the cutting material. Can anyone tell me if pawpaws will grow in large pots? 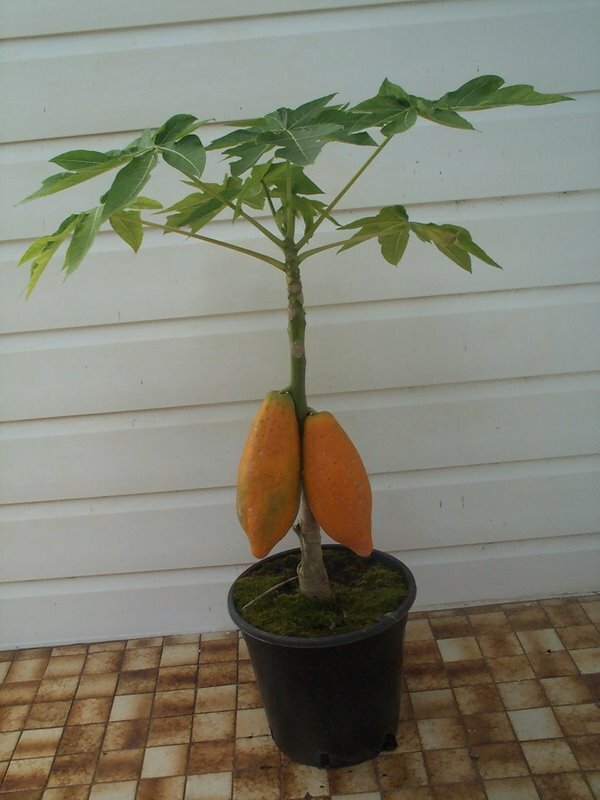 I have just purchased a bisexual pawpaw plant and would like to grow it in a pot. I grow my citrus in large pots and they do just fine! Yes they can grow well in pots, the cutting grown and grafted ones would be best for this as they produce sooner and are shorter in height. Seedlings will tend to grow too high and will be short lived in pots. Thanks Kath - Is there an ideal size pot I should use? 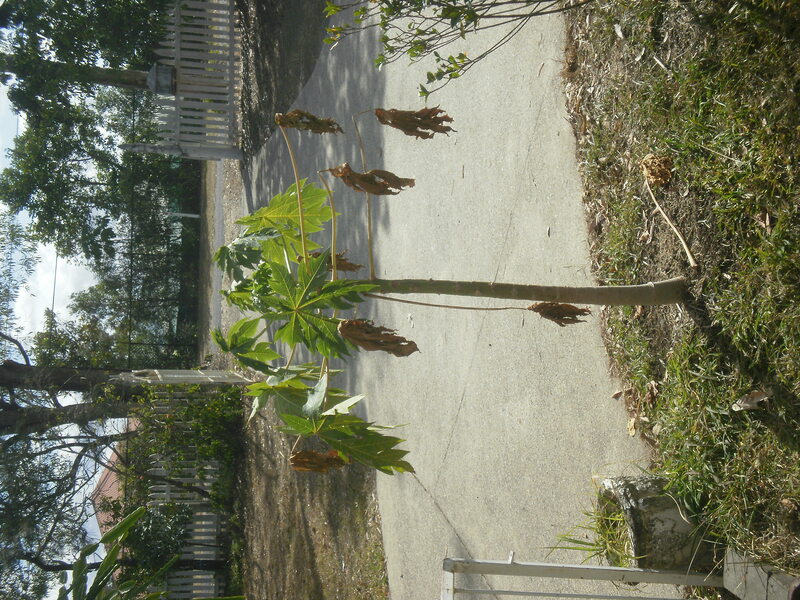 The pawpaw I've bought is a Carica Papaya and says it will grow to 8m. The bigger the pot the better, it would need to be at least 35L. We have grown them into the bonsai bags here at the nursery successfully, these are 35L. These can then be slipped inside an ornamental pot if you want them to look fancier. 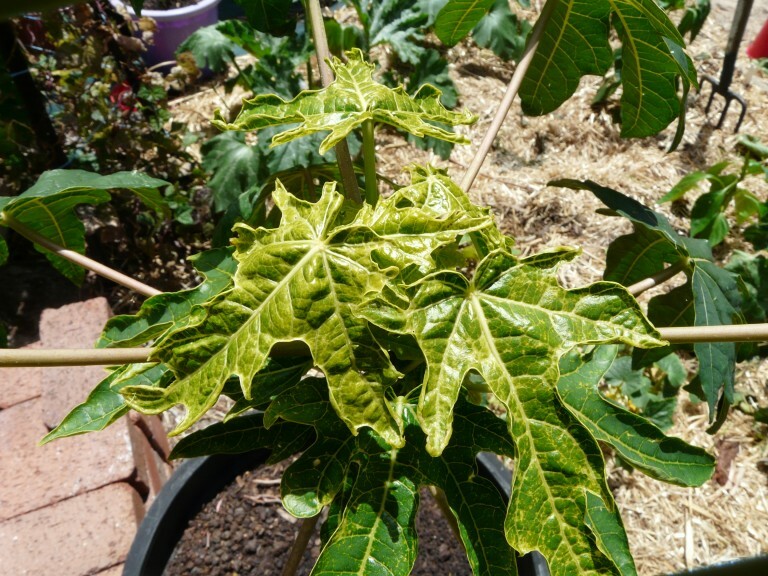 Here is a picture of a paw paw in a pot. You are joking!!!!!!!!!!!!!!!! In such a small pot???????????????? I have a round pot that is 55cm diameter at the top and 35cm deep (to the reservoir) and was wondering if it would be ok until I saw Correy's reply - I think it may be big enough hey? 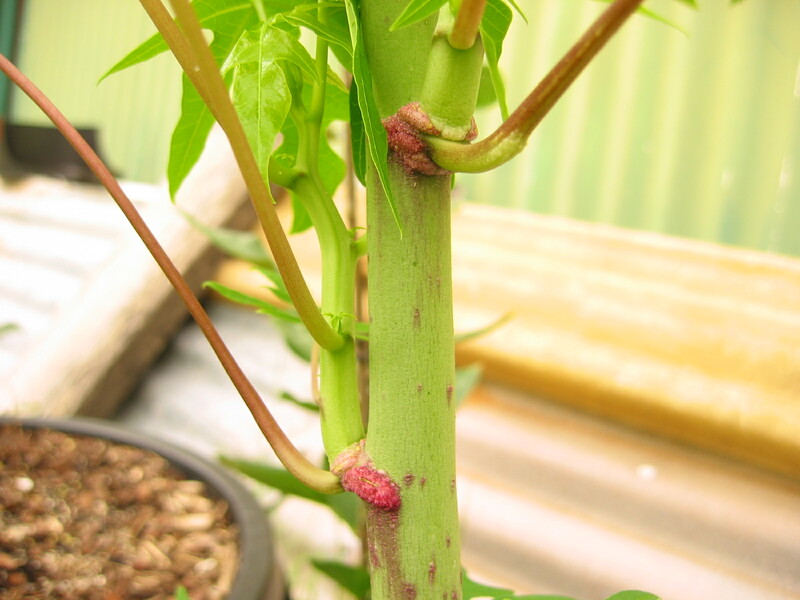 Does anybody know what this red fungus on the pawpaw branches is and how to treat it? I would think you would need to drench the soil around the tree with Fungus Fighter or some other fungal treatment - ask at the local nursery. Has it only happened since we have had all the recent rain in Brisbane? Pawpaws like water to run past their root system but cannot tolerate wet feet. Corry, try a wek milk solution on it. Looks smillar to mildue on grapes. Only %5 and no more than 10%. Thanks Lyn and John. Yes we have been getting a lot of rain here in "Sunny Brisbane" which I think is the culprit. I have a good potting mix though with lot of drainage. My paw paw is about three months old now and has grown from seedling over a meter. Its only supposed to grow 2 meters, but it looks like is starting to flower already. But thats not my problem, my wife and her sis want to eat the young delicous leaves. I planting another this week. 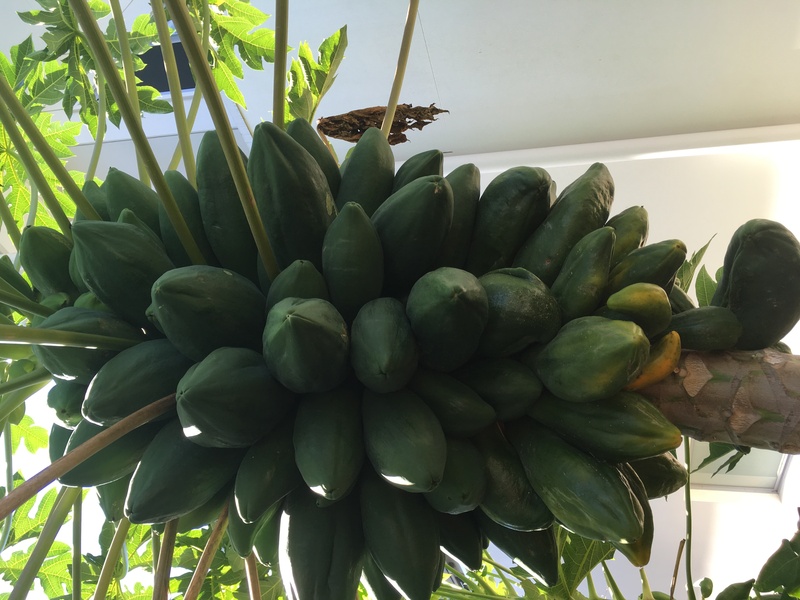 Hay Kath we have 53 durians growing with more to come. Duriums are an attraction to my girls. hehehehe and me of coarse. 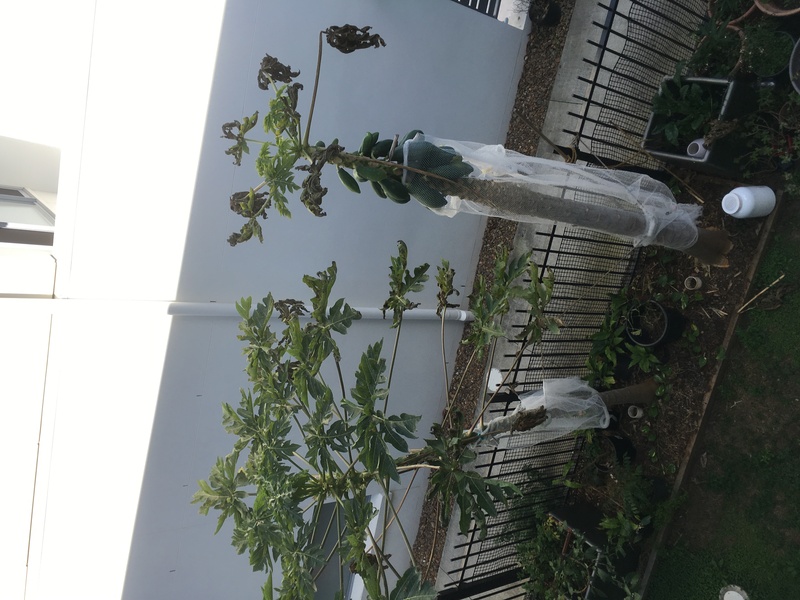 hi guys!is anyone got the solution to this pawpaw problem: we have a few small pawpaw trees 1metre+ and they have a beetle inside the trunk at the top, making the trunk contortionned and rotting and the top leaves, the new ones, all shrivelled. should we cut the rotten bit and take it away from the others and hope for the best or is there a natural born spray that we can use to save it?? have to stick through the trunk. I have lots of pawpaws and they like water but not wet feet. They have to be well drained. This may be the cause for the flowers dropping off. If the fruit is too high it may be time to cut the trunk off and put a can over the cut so water doesn't rot the center and a new suckers should grow up beneath the cut. How do you know it is a bisexual pawpaw? 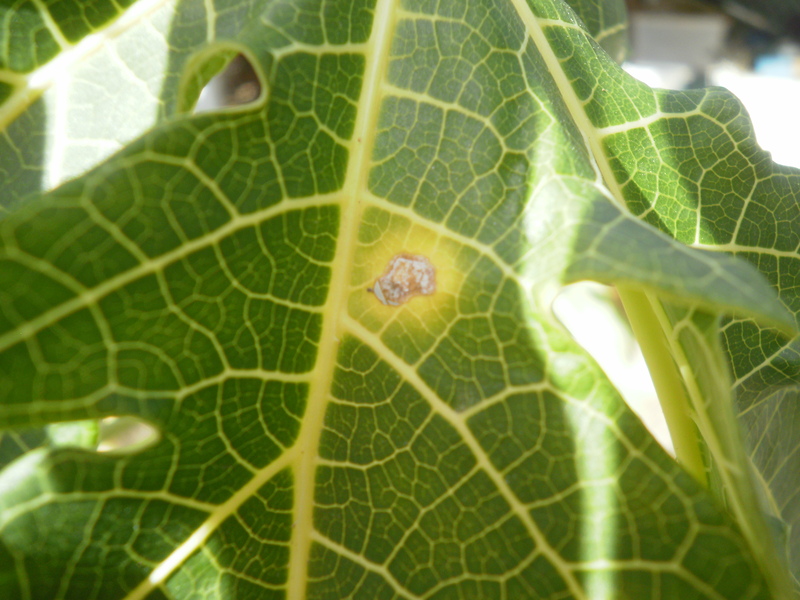 Black spots under the leaves - leaves need to be sprayed with copper sulphate! Seems to be a common problem lately. Can someone please tell me when do I harvest the Paw Paws. We have a lot on the trees and I don't know if I should pick them green or wait for the colour to change. Some of them are huge. growing up from just under the dead top. Long term it is best to cut the tree to a manageable height - sometimes it means losing some of the fruit - but any Asian families will be glad of the unripe fruit as they use it in curries and salads - put some alfoil or a tin on the cut trunk to prevent water rotting the trunk. If bats are getting fruit - get some onion bag material(sometimes you get onions, oranges in this type of open weave bag) and cover fruit to allow you to ripen fruit without being attacked. Hope you get to enjoy some!!!! Merry Chrsitmas!!! To Helen : Duh.Pick when fully coloured,before falling and before bats. To Bett Taylor : Has the Papaya survived? It looks like you cut it in about June,when it is too damp, cold and dark. Kerrie says..."Locals reckon a long stick but I think I'd have problems finding a 15m stick..."
Thanks Lyn and Wayne. Local guy offered to climb the tree and gather some fruit for us. After an interesting moment when a side branch broke off while he was on it, we ended up with 20 medium sized green ones. I've reassessed the height of the tree and we're probably talking 10m height LOL - it helped to see someone halfway up to get a better idea! I will be doing the cut halfway thing next week. And yes, the land of the papayas, definitely! No shortage here. The variety seems to be smaller than the ones you've got photos of on this forum though. To Helen: We pick our paw paws when they just start to go yellow. Even just a hint can be enough. Whatever you do don't wait until they are fully coloured unless you're into feeding the local wildlife. We bring ours inside and let it ripen in a cupboard wrapped in newspaper. They ripen beautifully and seem none the worse for being picked before fully ripe. Experiment a little and you'll find your rarely lose any fruit. I have 3 tops of paw paws ready to be planted. I have phoned 3 Nursery's and they have never heard of Bonsai Bags. Urgent help as feel the paw paws are needing to be planted. Great ..... Will get the map out and the Sat Nav charged up. I am growing red paw paw, the plants are about two meters now and they are both producing fruit but the fruit seems to be very slow growing. Is this typical or should I be giving it a nutritional boost of something? I live in Brisbane and it is very warm at the moment. Can you give me some advice about watering and general care too please?? I think they needed fertilising if the rain has made the fruit kick and I think a watering once a week should be enough Julie, I rarely water mine , they just get some whenever I water the grass. For the yellowing try a good spread of dolomite under the tree as well as some epsom salts, but not to much of that. Several people have asked about where to cut off a pawpaw when necessary.We live in an area that is normally frost free but last year we had a severe frost when we were away, so could not water the trees before daylight to save them. They were really scorched and looked as if they might not make it. An old friend who used to grow pawpaws commercially told us to leave them right alone till spring, then cut them off. He explained that if you look closely you will see lines going around the trunk that sort of make circles. In one place the circles will be much closer together. (It's usually about a metre or so from the ground and the tree will shoot again below this. )The best place to cut through the trunk (on a bit of an angle )is in the middle of where the circles are closest together. Then put a tin or bucket over the exposed trunk.- it's best to leave room for a bit of air to circulate. Don't seal the wound or it will rot. I used some 5 litre buckets that had lost their handles.Then give it a couple of handfuls of Dynamic Lifter or old chook manure. All of our trees survived and have produced a good flush of fruit since. You might have to sacrifice some fruit if you choose to reduce the height of the tree. But pick a time when there is least fruit - you will be repaid many times over when it shoots again. I noted the query re small pawpaws. I'm no expert but for what it's worth here are a couple of hints I've collected over the years. Pawpaws like and need extra calcium as Wayne says. 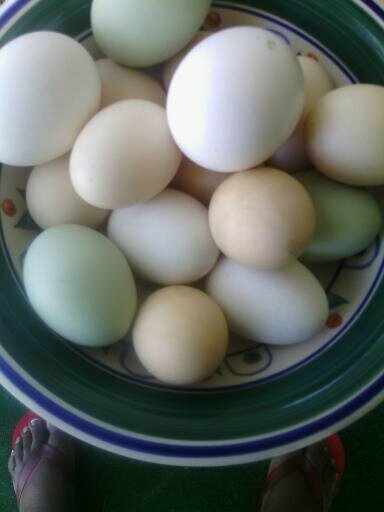 Crushed egg shells are a good thing to use under pawpaw trees. Don't just use the broken shells, they take too long to break down, even with lots of mulch. I put egg shells through the food processor to smash them up fairly small. I collect about an ice-cream dish full then process them in one session. Saves a big clean up too often. Save the shells in an open dish and put it in the sun or in the oven on low every few days to dry out. Otherwise they stink after a day or two and it would not be too good to put them in the food processor. Alternatively, grind them up some other way, the aim is to get them fairly small somehow. Also, if chooks run under the trees, you don't want them eating recognisable egg shells, it encourages them to eat eggs. 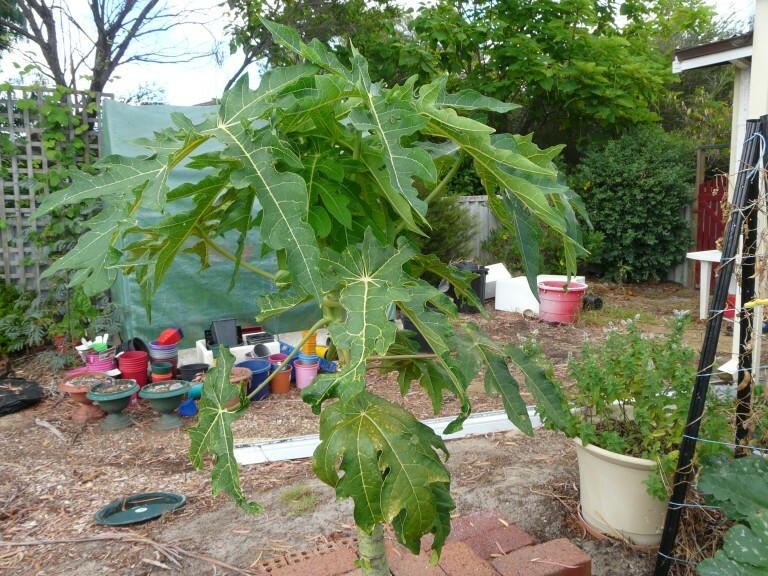 An old friend of ours who grew pawpaws for a living, said to use Dynamic Lifter or fairly well composted chook manure every spring and use plenty of mulch. Pawpaws are not "greedy feeders" like some trees but they do appreciate being fed now and then. Our old friend also said the best thing for pawpaws is some urine now and then. While not for the faint hearted, collect urine in a bucket, dilute at least 50:50 and give them a "dose" every couple of weeks. Mine get their turn about every 3 or 4 weeks because we have quite a number of trees. 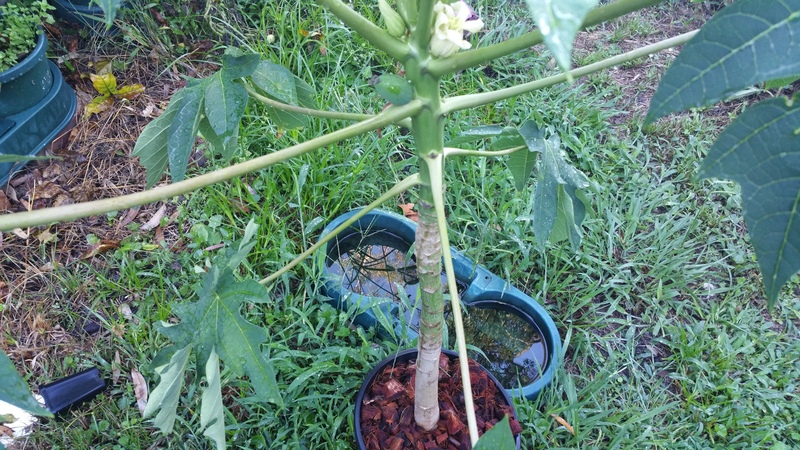 Hi Correy - thanks for your great video - I have a great red pawpaw that just grew on its own from seed - it's really three trees in one - and it seems to like the potato plant the always comes up around its roots - my question is: how did you go about planting the trunk cutting because I would like to have a go. 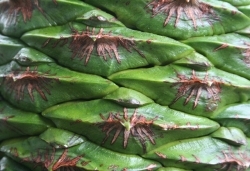 Did you wrap it in peat moss in a plastic bag to make the roots grow on the severed end of the trunk and then plant it or did you just stick the trunk in the ground? I have a number of paw paw trees loaded with fruit, some have turned yellow but are very very hard. The fruit is emormous in size, some of the smaller fruit has fallen when green...please help, the trees themselves are healthy. To soften the fruit sprinkle borax around under the tree, about a tablespoon per square metre. To soften the fruit on the tree spray with borax, about 1 tablespoon per 9L of water. I have not long done my trees and it works a treat. You will notice a difference within a week. I also spread some epsom salts, 1/2 handfull per square metre, and the flavour improved immensely. I have grown 2 paw paw tree in my my backyard in Jan this year and they are growing very well. In fact, one of them has started to fruit with almost 8 to 10 frowers on it (its barely a metre high ). I live in Sydney and am not sure how to protect the trees during winter (from the frost). Any advice in this respect will be greatly appreciated. I have a very peculiar problem with our previously healthy young tree which was setting fruit easily & then just in the last few days the new growth had started to yellow & around both the young fruit & the trunk there is a waxy substance. Hopefully it's just a calcium/magnesium deficiency, dolomite and magnesium sulphate could cure your problem. You might also like to give it a spray with mancozeb just incase - and don't forget the wetting agent. The problem we have with Pawpaws here [in our area] is that when they get sick they go down very quickly. 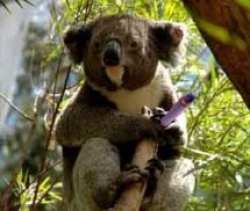 That's true Johno, tricks the possums to, we shouldn't have to share with these critters I reckon. I wanted to ask what people think of the Pawpaw - Southern Red here at daleys. i want to plant two in a greenhouse so preferably i think a dwarf variety that grows about 3m would be ideal and i want to know what the fruit is like and how long they take to fruit. I was going to buy the cutting variety they sell as they seem to fruit almost straight away and are a dwarf variety but they are never in stock. I have had a young papaya in the greenhouse all winter where it lost most of its leaves except those at the top. It has been outside, repotted for about 6 weeks & it suddenly put on a spurt of new leaf growth from the top. Trouble is all those new leaves are yellow with greenish mottling between the veins. Could it be iron deficiency? Maybe I should pee on it after taking iron tablets,ha ha! Thanks Danny, but now I am worried for my babaco & hope its not as susceptable. Re.the virus I doubt if there is another pawpaw within 30ks so it would be unlikely wouldnt it? How many do you have? Strange but i am also trying snakebeans this season & their first leaves were very similar in colour, but they seem to be growing out of it now & the plants are now spiralling upwards so I am just wondering if cool weather had anything to do with it? My melons, & cucs & zucs are fine. Pumpkins, well that is another story. 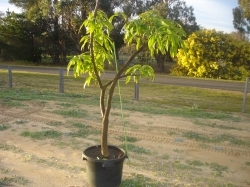 See "heat stress"
Hi SG, try chopping your pawpaw tree off about 600mm above the ground, jam a tin on the top, and allow about 2 or 3 shoots to grow. Give it some dolomite & sulphate of potash, plenty of mulch and you should be right. 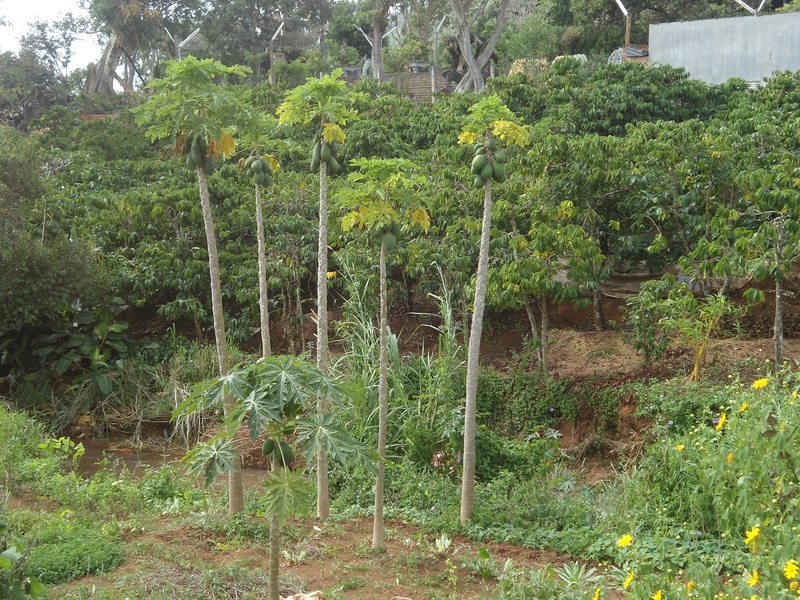 Cut down 8 Papaya trees today in mine and my neighbor's yards. Oh well, less bats outside my windows. I just hope the virus didn't spread to my babaco. Hi Micarle, should've just cut them off and put tin on top, see my post above. Lucky for me they were only small!! I have some large Paw paw's i didn't want to get the virus! So they got pulled out!!! If it re appears on any others i will try your Trick Brendon..
With your advice maybe Ive beaten it! This is the cauli head after giving it dolomite, & sulphate of potash, but instead of cutting the head completely off & putting a can on it I left the strongest growth & carefully cut all the others off! Now there are even baby flower buds on it! Can somebody please tell me what to do with my paw paw tree . It had heaps of fruit and they are all dropping off before growing. The tree looks healthy. Yes Alex, You will just have to move the house! :) BTW Im not jealous or anything, much! Comeon kert you know how to delete so please get rid of this crap! I see there have been discussions about dwarfing.There are a few common practices people use to keep paw paws short.Planting them in full sun and chopping off or bending the taproot before planting out.I have seen some done this way and they seem shorter and heavier.Like many people I chop the tall plants off low when I can't reach the fruit on the ladder and them them multiple branch.They can get very tall.Cutting grown plants seem weaker,less productive,fall over easily and never become whoppers.There are a few genuine dwarf varieties or lines. i'm not sure what you're saying Mike. 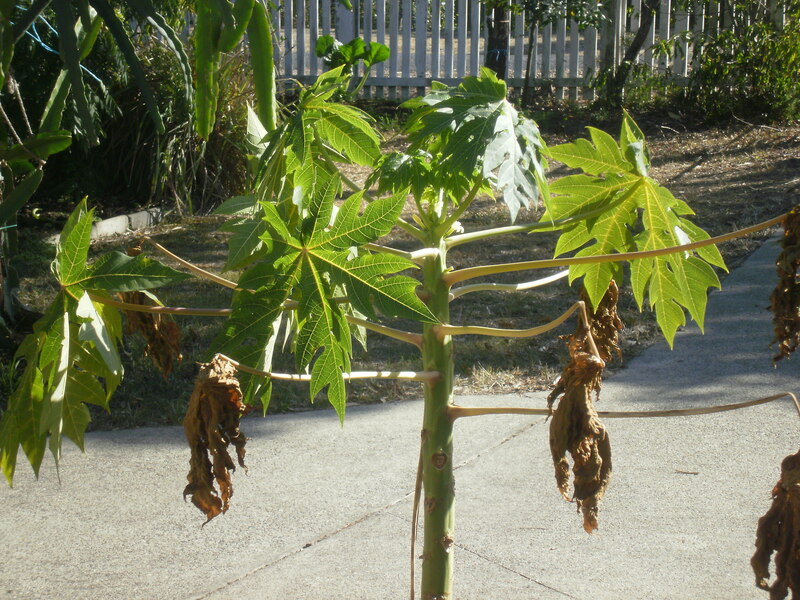 Are you saying that you can lop off all the leaves and part of the trunk and the papaya will regrow as a two trunk specimen? Now that is the best idea for a dwarf yet.There are several asian dwarfs as well.Hawaii and SE Asia have GM paw paws that are much more disease resistant but not allowed into Australia. If they are losing their older leaves its still not warm enough. Try feeding them with chook pellets & powerfeed. If they are in pots they may need potting on. We do not have a suitable garden area to grow pawpaws but I would very much like to grow one. Can I grown one in a container of sorts. Yes Elizabeth, absolutely you can. Pawpaws and papaya rank among the best things to grow in pots. I think Corey (regular forum contributor) does this, he'd be the one to ask when he comes on. I was wondering if someone can provide some advice as to what might be happening with my Red Pawpaw tree. It's a bisexual , purchased in a pot about a year ago, I dug a hole and prepared the soil with recommended fertiliser including dolomite and lime. 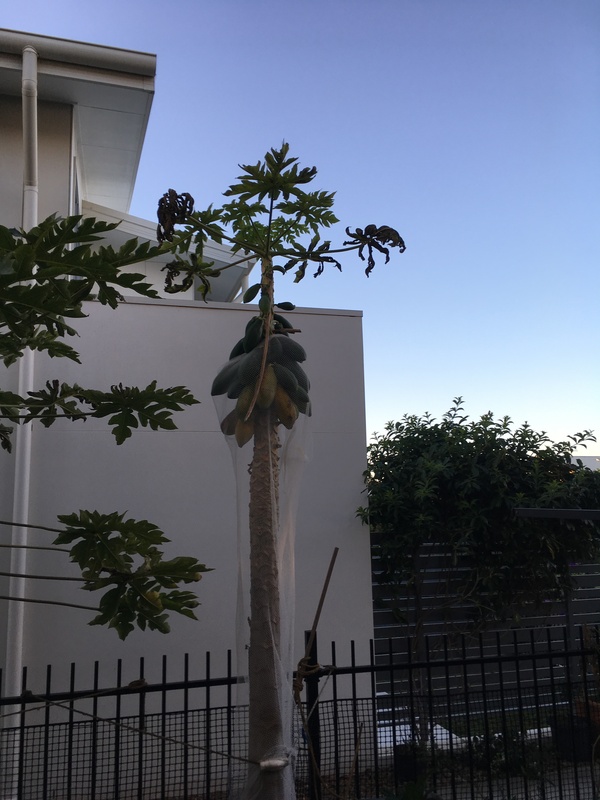 The plant established and grew, plenty of flowers in first year and dropped, some of the early leaves changed to brown, dried and eventually drop off. The tree seems to have stopped growing in height. Large trunk at the base and skinny at the top. ground underneath the plant is unfortunately hard ground and possibly clayish. I only water it as recommended by the instructions that came with the plant. Doesn't look too bad Peter. The new growth shows that the warm weather has got it going but it could be a bit hungry. 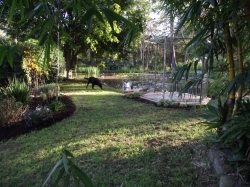 I would put some mulch - 15-20cms deep -around the base of the tree, maybe with some dynamic lifter or compost underneath, and keep it from touching up against the trunk. This mulch will keep the moisture more even and encourage worms/microbes in the soil. You can pull the mulch back every now and then and check the need for watering that way (to see if it's too dry or too wet with what you are giving it). Will need another feed and mulch in early autumn and again in spring. They are hungry, fast growers with a short life but yours looks OK. The old, last season leaves fall off after winter and look like yours does. Paw Paw trees pictured growing typically in a backyard in rural Vietnam. Very common there but I only saw tall ones, no dwarf varieties. Cheers! Is anyone successfully growing paw paw in a pot and getting fruit? I was given a cluster of seedlings, after separation it looks like about 8 of them are going to survive. I do not have space in the ground for them so I am looking at growing them in pots. Thanks Mary, how large does the pot need to be? Thanks for the advice. I have taken new photos and will upload by Friday this week. 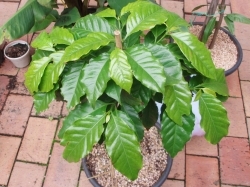 Unfortunately I have not got around to providing it with the required fertiliser, it mentions Nitrophoska...I went to a few nurseries around where I reside, near Beenleigh and none seem to have it or know what it Nitrophoska is. It has a few flowers, once again it has lost quite a few flowers. Still a few more flowers on it but main trunk seems not to grow taller, its' like it has stopped growing tall and only branches are projecting up and out. We have moved to a new house and have 7 Pawpaw trees about 3m plus tall. Some have had the tops taken off and have put side branches out. All are fruiting and or flowering. The one with the ripest fruit is dropping them whilst they are green. What could be the problem and what should we do to fix? I am getting sick of green papaya salad and yearn for a ripe one! Anyone have any dwarf pawpaw seeds they'd be willing to share/trade/sell?Have had a look for the Taiwan Red Lady but doesn't seem much around besides in India and don't like my chances there. I have some good reds - from FF seed - but not sure yet if they are dwarfing. Al, I ended up with one single solitary dwarf seedling out of a packet full of seeds. I'll take some cuttings from it at the earliest opportunity. Could take a coupe of years to be mature enough to take cutting material. You could strike some cuttings from any PawPaw, they fruit very low to the ground like this red RB6 I struck last year, and RB6 don't like this climate. Papaya are like that for me too. I'll sew 50000 seeds and 6 will germinate. Then I'll buy a fruit, scoop out the seeds and throw them on the compost heap and 75% will germinate. i had to pull two Paw paw trees up which was setting mostly on top of ground. The leave have started to die off, turning brown, i put them in separate pots with fertilize and new soil. What do you think the chances are of them surviving? 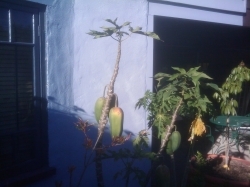 We bought two carica papaya seedlings from Daleys probably 18 months ago, and had the most amazing crop of fruit. As the weather cooled this year, the larger tree appears to have become sick - dropped most of the leaves, trunk became thin, fruit skin becoming brown and now falling off. It's smaller 'sister' tree looks fine so far. I'm not sure if it's a sickness (infection that can spread to the other tree?) or a lack of some nutrient. Has anyone had experience with this condition and have advice? Thanks for the reply. We live in Brisbane, we have had a few cool nights but I think it started to struggle before the cold. Perhaps as you say it may have been exhausted by producing a bumper crop. The smaller sister did not produce nearly as many. 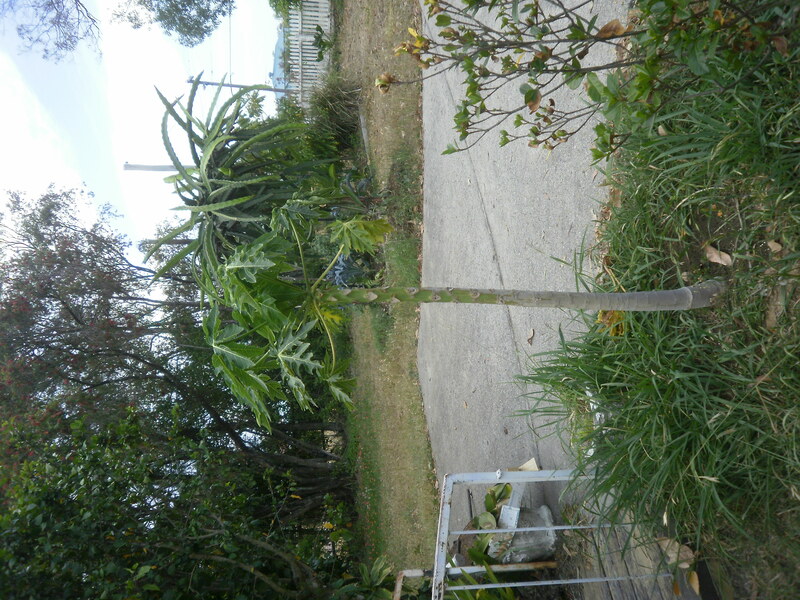 I have attached a photo of the two trees side by side today, and one of the big sister in fruit. I'm wondering whether we should top the big sister (she's getting rather tall anyway) or whether that would set her back further. Thanks for any advice.